Heart conditions are the number one killer in the western world, yet most of the conditions are preventable and can be improved with a healthier lifestyle. Tai Chi is shown by medical studies to improve most health conditions. Dr Lam's team has incorporated medical research an... read full description below. Heart conditions are the number one killer in the western world, yet most of the conditions are preventable and can be improved with a healthier lifestyle. 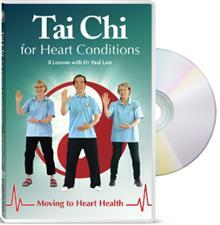 Tai Chi is shown by medical studies to improve most health conditions. Dr Lam's team has incorporated medical research and traditional Chinese medicine into the ancient art of tai chi to create an effective programme. It can prevent or improve most heart conditions, as well as improve balance, immunity and relaxation.